You've now added Suomen Lasimuseo (The Finnish Glass Museum) to your itinerary. Deepen your sense of the past at sights like Seurasaari Island and Open-Air Museum and The Esplanadi Park. Your cultural itinerary includes sights like Rock Church and Sea Fortress Suomenlinna. 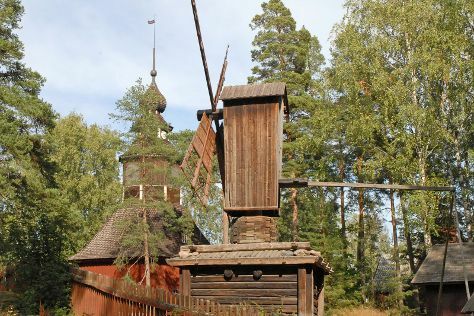 Change things up with these side-trips from Helsinki: The Runeberg Home (in Porvoo) and Kotka (St. Nicholas Orthodox Church, Beach Mansikkalahti, & more). Next up on the itinerary: take a stroll through Katajanokka, look for gifts at Taiga Colors, pause for some serene contemplation at Helsinki Cathedral, and make a trip to Market Square Kauppatori. To find maps, traveler tips, and more tourist information, you can read our Helsinki trip itinerary site . If you are flying in from Singapore, the closest major airport is Helsinki Vantaa Airport. In August in Helsinki, expect temperatures between 24°C during the day and 13°C at night. Wrap up your sightseeing on the 6th (Tue) to allow time to drive to Porvoo. Söderskärin majakka has been added to your itinerary. Start off your visit on the 7th (Wed): revel in the low prices at Brunberg Candy Factory Shop, then look for gifts at Pieni Suklaatehdas, then examine the collection at Directions Lahden historiallinen Museo, and finally pause for some serene contemplation at Church of Hollola. Here are some ideas for day two: stop by Riimikko, contemplate in the serene atmosphere at St. John's Church, then steep yourself in history at Saint Peter and Saint Paul Cathedral, then don't miss a visit to Main Building of Military School, and finally pause for some serene contemplation at Pyhtaa Church of Saint Henry. To find maps, ratings, and tourist information, refer to the Porvoo day trip planning website . You can drive from Helsinki to Porvoo in an hour. Another option is to take a bus. Expect a daytime high around 23°C in August, and nighttime lows around 13°C. Wrap up your sightseeing by early afternoon on the 9th (Fri) to allow time for the car ride back home.